While many homeowners spend a lot of time calculating the right BTUs required to keep their home warm all winter long, some still overlook the importance of the right furnace blower. Choosing between a single speed furnace and a variable speed furnace is tricky, but it’s worth figuring out before you order your next set of furnace upgrades. Consider the benefits and requirements for each type of blower to match the right equipment to your home. As the name suggests, single speed blowers are either on or off and run at maximum speed when on. This gets the air moving around your house, but it doesn’t work as well when you’ve got dozens of small rooms, multiple floors or a zoned heating system. You’ll also notice a louder rush of air when these blowers start up. 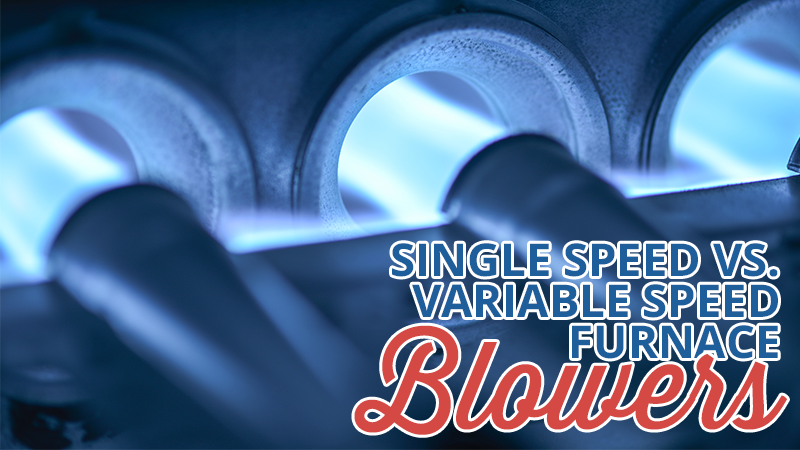 They are the most affordable option, and many furnaces feature single speed blowers as a standard feature. You’ll spend more over the life of the single speed blower on electricity to keep it blowing because it runs at its maximum power draw every time it switches on, unlike models with more in-depth controls. A simple upgrade to a dual-speed blower fan is well worth the cost of calling an HVAC contractor to handle the installation. With a high and low setting, you can better control how quickly each part of the home heats up. Most models integrate with the thermostat for automatic speed switching, and many two-stage blowers can be used for continuous air circulation. This is a technique in which you keep the blower fans running constantly to circulate air at all times, capturing more dust in the house filters. You need blower controls and motors that can handle continuous operation, and not all two-stage blowers are designed for running this way. Variable speed blowers are the most advanced, and, therefore, the most expensive, option for moving air from the furnace. These units adjust the fan speeds as needed for the ideal mix of air, achieving better temperature controls while using less energy. You’ll earn back what you spend on installing a multi-speed blower over the years in reduced electricity costs. This equipment is also the quietest of all blower types, which is essential if you’re tired of being woken up by noise when the furnace kicks on in the middle of the night. If you have a large home with multiple floors and zoned heating, you may need a variable speed unit to get the results you want out of your heating system. Discuss your home, your heating needs and your current furnace equipment with an HVAC contractor to figure out which blower system is best for you. Pick up the phone and call Metro Comfort Systems if you need more help deciding between the various types of furnace blowers on the market today.